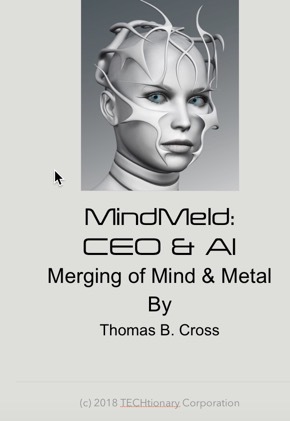 The following is the introduction to MindMeld: CEO & AI Merging of Mental & Metal book available now via iBooks – Available on iPhone, iPad, iPod touch, and Mac. Book Review – “As the CEO of a energy industrial company and actively involved in CEO Leadership Forums I have been following AI for more than a decade. Indeed the promises for improving many technical tasks are interesting yet in reality often prove more complex to manage than proposed. MindMeld was very profound in proposing that AI starts not at the bottom of the organization but with CXO decision-making and worth reading by anyone in or rising to the boardroom.” George B. This book MindMeld: the CEO and AI is meant to plant the seeds of knowledge about a young but growing new field. In the pursuit of this new technology, it is important to remember that technology accelerates faster and faster while increasing humanism cannot be denied. No matter who you are or what you do, MindMeld: CEO and AI is a book you must read to understand the vast technological advancements coming your way—advancements that will impact how you do business… how you make decisions… how you communicate… how you live. It’s your personal guided tour into the latest trends, issues, problems, challenges, and promise of our technological past, present, and future. Beyond mere theory and speculation, you’ll see firsthand the very real developments in Knowledge Technology Artificial Intelligence and Expert Systems Visualization Knowledge Networking Systems. Cope with the limitation that present technology is hardly more advanced than the Model T was in its time period and the technologies that will emerge even only 10 years from now will be as dramatically different as the jet airplane is from a candle. Chapter 1 – Trends in Knowledge Technology examines communications and information technology in business and business management. Topics include: the move away from the pyramidal business approach; the development of virtual management, which stresses the incorporation of new technology with humanistic concerns; the multidimensional management system which recognizes the individual employee as a data base management system in itself; and computer communication, networking, and computer-aided management. Chapter 2 – Issues in Knowledge Technology takes a look at various problem-solving strategies for use in business management, the limits of information in a machine as well as humans, the concept and limitations of time in business decision-making, and language as it relates to understanding. Important to this chapter is the emphasis on human/machine relations and how they work together, rather than deciding which is better than the other. Chapter 3 – Expert Systems defines and explains the various aspects of this science, which is considered both a part of, and a separate entity from, AI. With an emphasis on reasoning about the knowledge underlying human expertise, as opposed to the emphasis on knowledge itself that characterizes AI, Expert Systems examines the need for establishing standards; inference, reasoning; and natural languages. Chapter 4 – Visualization Systems are systems capable of providing simulations or models of the physical world. Still in an early development stage, visualization systems, their current status, and potential are examined. A detailed look is taken at computer-aided programs and the current state-of-the-art in such systems. Specific topics in “Visualization Systems” include conceptual information processing, spatial reasoning, and communication and information theories. Chapter 5 – Artificial Intelligence provides a new look at AI. Most important are some of the philosophical developments that laid the groundwork for AI. Robots, as opposed to machines with intelligence, are also studied. This chapter concludes with a discussion of an architecture for intelligence. Here, the need for standards, an idea first introduced in Chapter 3, is reemphasized, and virtual processing, a mental gaming process that devises ways to probe and enhance the abilities of both the brain and the machine is introduced. Chapter 6 – Knowledge Networking Systems are the subject of Recognized as the technology that will probably cause the most dramatic change in business and business management, these systems are studied in relation to organizational communication and corporate management. Topics in Knowledge Networking Systems include human interaction, perception, organizational relationships, organizational networking, decision making, and online idea exchanges. Chapter 8 – Future Trends concludes the book. Planning and methodologies for the practical applications of knowledge engineering are reviewed; a sample business plan and a short term information resource management plan are also included. Anticipation technologies are discussed as issues for future users and designers of artificial intelligence. The text ends with a reemphasis of the need for a working relationship between the people and the technology: “The interdependence of technology and behavior cannot be overemphasized. This book is meant to plant the seeds of knowledge, to instill that sense of wonder about a young, but growing new field. In the pursuit of this new technology, it is important to remember that humanism cannot be denied. MindMeld is meant to expand “human effectiveness and efficiency,” not replace it. – Real Time: Can Machines Think? The author and publisher of this book have used their best efforts in preparing this book and the programs contained in it. These efforts include the development, research, and testing of the theories and programs to determine their effectiveness. The author and publisher make no warranty of any kind, expressed or implied, with regard to these programs or the documentation contained in this book. The author and publisher shall not be liable in any event for incidental or consequential damages in connection with, or arising out of, the furnishing, performance, or use of these programs.